I'm now safely back in New Zealand following my whistle stop tour to Canada to attend the AmiJAM 2013 Amiga show in Calgary. It's almost 30 years since my last visit and the city has changed over the intervening years. It's population has continued to grow and now exceeds 1 million making it Canada's third largest city. 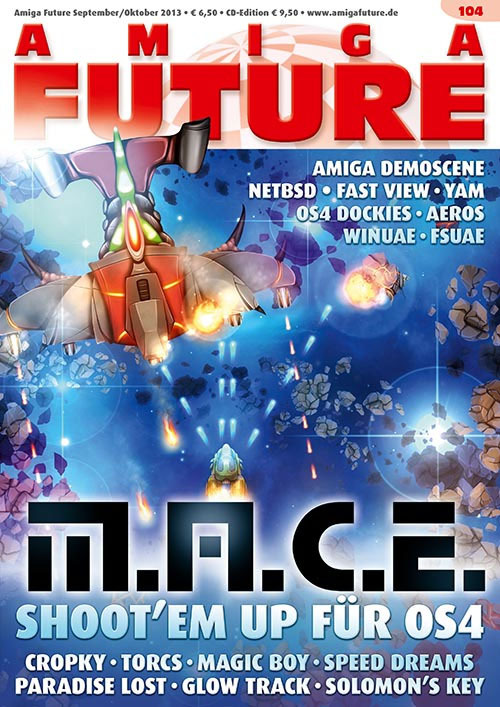 Look out for my AmiJAM 2013 show report in the next edition of Amiga Future magazine. While I was in Calgary I was the guest of Steven Solie and his family who looked after me and made sure I did not get into any trouble. 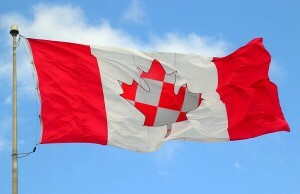 During my stay I was able to dispel a few Canadian stereotypes. People do not say "eh" at the end of every sentence. Nor do they say "aboot". It actually sounds more like a cross between "aboat" and the British way of saying "about". Also I did not see a moose or the Royal Canadian Mounted police in their distinctive red coats and wide brimmed hats. I did eat pancakes with maple syrup for breakfast though! 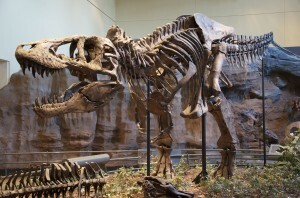 I used to be a Geologist, but I'm alright now! 😉 Apologies for the geological joke, but while I was in Calgary Steven and his family took me for a day out to the Royal Tyrell Museum in Drumheller, a town situated in the Alberta Badlands about 68 miles north-east of Calgary in an area know as Dinosaur Valley. 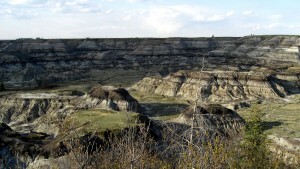 The region is a kind of miniature Grand Canyon and the dry coulees and buttes of the Red Deer River valley are littered with the most concentrated dinosaur bones beds anywhere in the world. Drumheller certainly lived up to it's claim as the Dinosaur capital of the world with its museum home to the world's largest collection of complete dinosaur skeletons all retrieved from the surrounding area. If you ever find yourself in this region the museum is well worth a visit, but allow a couple of days to visit the museum and the surrounding area. 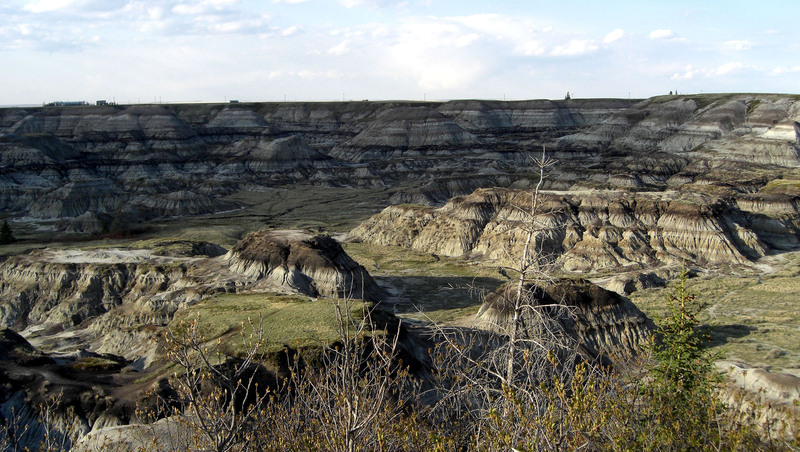 Better still, take a guided tour of Dinosaur Provincial park in nearby Brooks and see the Museum's dinosaur "hunters" in action. It's rather reassuring to meet other people who are just as crazy about the Amiga computer. 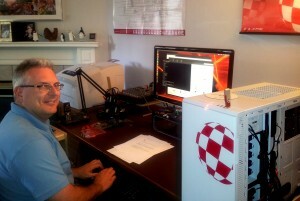 If you read my blog you will know that I recently I met with David Aiau who is dedicated collector and even has more AmigaONE X1000's than I have! If you are planning to be in the North West of in England in mid October you might want to check out Play Expo at Event City in Manchester. now.play - previews of the latest games and hardware from companies Nintendo, Ubisoft, Namco-Bandai and Oculus Rift, etc. pro.play - casual and competitive tournaments including FIFA, Mario Kart, Halo and Minecraft plus the UK qualifier for the Super Street Fighter 4 Capcom Cup with a trip to the USA for the winner. 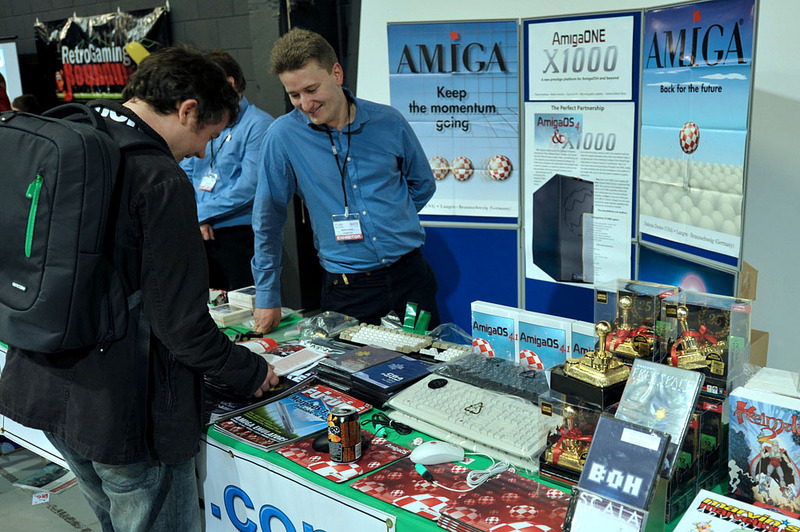 AmigaKit, as they did last year's show, will displaying their wares in the re.play area and will also be representing A-EON Technology. Not only will they have a large selection of goodies for Classic and Next-Generation Amigas, they will also have AmigaONE X1000 systems available for sale on the day. 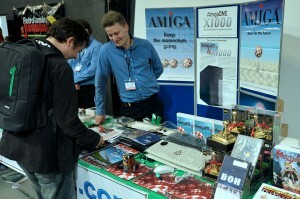 So get along to Play Expo meet up with Matthew and Christopher and grab yourself an Amiga bargain. I continued to be amazed by what talented developers are achieving with field-programmable gate arrays (FPGA). I was already aware of the Chameleon cartridge developed by Jens Schönfeld of Individual Computers. 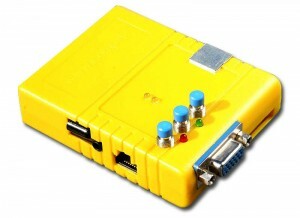 The Chameleon, which is an is an extension of his earlier C-One work, emulates multiple Retro computers including the C64 and Amiga and can be plugged into the C64 cartridge slot or used as a standalone unit replacing the computer, the floppy drive and the heavy power supply. An optional docking station is also available which provides 4 joystick ports and connectors for an Amiga or C64. 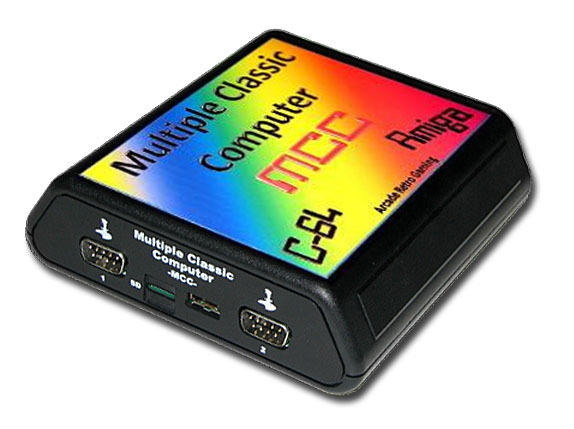 The Chameleon comes with many extra features as standard including a Turbo mode, 16MB Ram expansion, battery backed real-time clocked and full 1541-emulation. 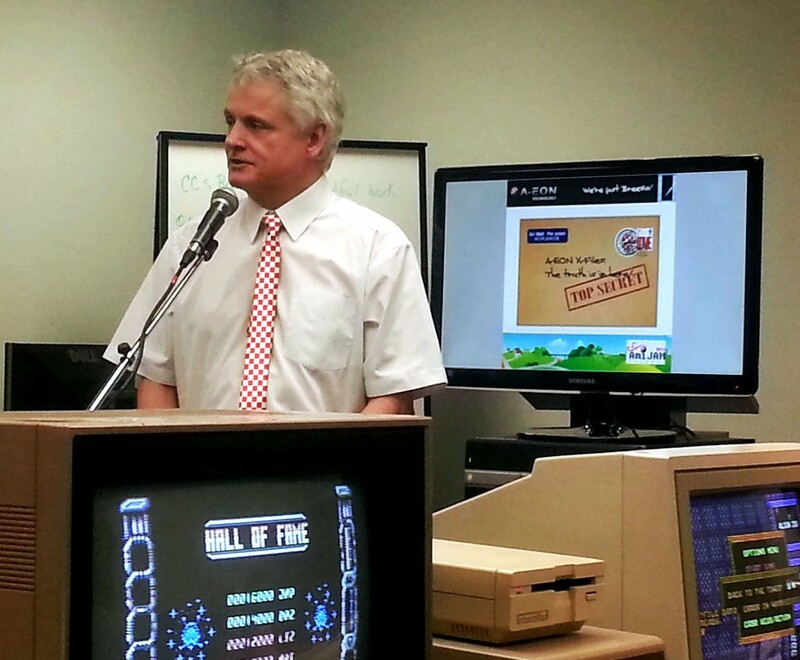 At the AmiJAM 2013 show I got my first taste of the MCC (Mulitiple Classic Computer) system from Arcade Retro Gaming. Like the Chameleon, it is an FPGA based device, which can emulate a Classic Amiga, the Commodore C64 and an Atari 2600 computer together with several other cores including the ZX Spectrum and the Apple II. Unlike the Chameleon, it's only available as a standalone device and is supplied in a tiny case which includes full Micro SD support and is equipped with connections for a joystick, mouse & keyboard, and can be connected to a TV using a high quality s-video connection. Check out the links provide for more details about these "amazing" retro products. In my quest to find the best RadeonHD graphics card for my AmigaONE X1000 I've tested another two cards in the 6xxxx and 7xxx series. Don't get me wrong most, if not all of the cards work well with the AmigaONE X1000 and AmigaOS 4, but when it come to size, power requirements and fan noise level not all RadeonHD cards are created equal. 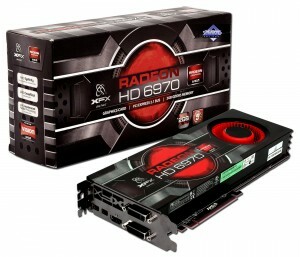 For my latest tests I selected two powerhouse cards at the top of the Radeon HD range. The XFX HD 6970 and the Sapphire HD 7970 vapor-x. Both cards use one PCI-e slot, but because they are dual width they block the slot immediately below. Both are also very long cards and take up a lot of space. It's a good job the that the case supplied with the AmigaONE X1000 "First Contact" system had enough spare slots and is large enough to take the extra length of these enormous cards. The HD6970 is supplied with 2GB of GDDR5 memory and require 3 additional power connectors. One 6-pin PCI Express power connector and one 8-pin power cable that users two 4-pin PSU connectors. A special jumper cable is provided which connects the two 4-pin connectors from the PSU to the 8-pin connector on the card. If you think that is bad, wait until you try to connect the HD7970. This power hungry monster is supplied with 3GB of GDDR5 memory and needs additional power supplied from four (yes, you read it correctly - four) 4-pin connectors from the PSU. Two jumper cables are provide to connect the four 4-pin connectors to the two 8-pin connectors on the graphics board. My A1-X1000 system is fully loaded with 6 additional HDDs, a DVD ROM drive, and a Catweasel Mark II connected to a FDD so I had to disconnect some of the HDDs to free up two of the additional 4-pin connectors needed to power up the board. The HD6970 has one on-board cooling fan, while the HD7970 has two. 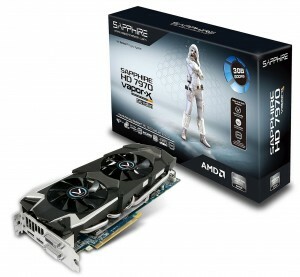 You might think that this would make the HD7970 card twice as noisy but you would be wrong! 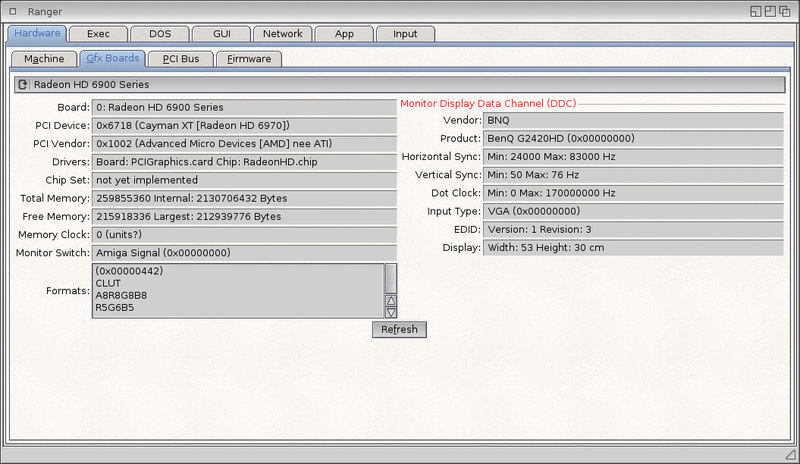 In operation under AmigaOS 4, the dual fan HD7970 is much quieter that the noisy single fan HD6970. Having said that, the noise from HD6970 is still less than the CPU fans on my G5PowerMac and iMac machines. As a test, to check that the noise levels were not related to AmigaOS issues, I tried both cards with the new Live Ubuntu Remix DVD. The HD6970 worked fine and 3D graphics hardware acceleration worked as expected, but the fan noise level was still the same as under AmigaOS 4. 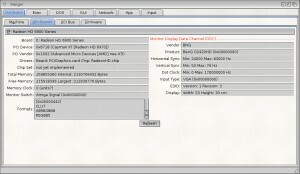 However, the HD7970 would not boot to the Ubuntu desktop, although I could still use Ubuntu through the console interface. So both cards have their advantages and disadvantages. Personally, even though it is quieter, I would not recommend the HD7970 because it requires 4 additional power connectors, which is not good if you have a lot of other HDDs etc installed in your machine. Also, if you want to try out Linux, the Live Ubuntu DVD does not currently work with this card. However, although the HD6970 works fine with both AmigaOS 4 and Linux, the on-board fan is far too noisy compared to some of the other Radeon HD cards I have tested. So out of all the 16 Radeon HD cards from the 4xxx, 5xxx, 6xxx, 7xxx series I have tried with my AmigaONE X1000 which one do I prefer? Currently my favourites are the PowerColor HD6850 and HD6870, Both work fine with AmigaOS 4 and Linux. The Sapphire HD5670 and Sapphire HD7750 are both fan-less and passively cooled cards and work fine under AmigaOS 4 and Linux, although the HD7750 currently does not support 3D acceleration with the Live Ubuntu Remix DVD. However, as always the final choice is up to you. Recently IBM announced it was forming an OpenPower consortium to licence its technology in an attempt to breathe new life into the PowerPC platform. It plans to open up its intellectual property, much like ARM has done, to hopefully create a broader base of users and system manufacturers. It seems IBM main aim is to licence its newer Power8 processor, but it has also indicated that it is prepared to license its earlier Power designs. 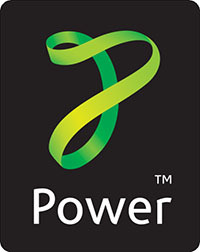 At the time of writing four companies have signed up to IBM's OpenPower consortium. 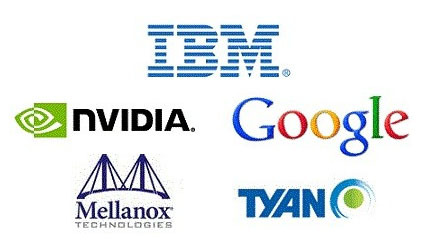 Google, Nvidia - the GPU chip maker, Mellanox Technologies – a networking and switch chip maker and Tyan – a motherboard manufacturer. A bit late in the day, you might think, but better late than never for Big Blue. Also now that PowerPC was announced to have "Little Endian" support Breno Leitão of the Linux Technology Center revealed that he would like to enable it on Debian as a ppc64el architecture. According to Leitão, " I have been working internally at IBM on a Debian rootfs that runs on this architecture. As a plan, I am looking, in general, to have this architecture included on sid, first, and then being moving towards stable." As our Linux Distro guru Pat wall commented, "(it's) always good to see something new happening in the PPC word 🙂 " It's not all good news from IBM though, especially as the company recently had lay-offs and asked its hardware employees to take a forced one-week furlough with one-third pay. A-EON Technology app store utility - coming soon to an Amiga near you. The main show starts on at 6pm on Friday October 18th with the traditional Classic Clinic. 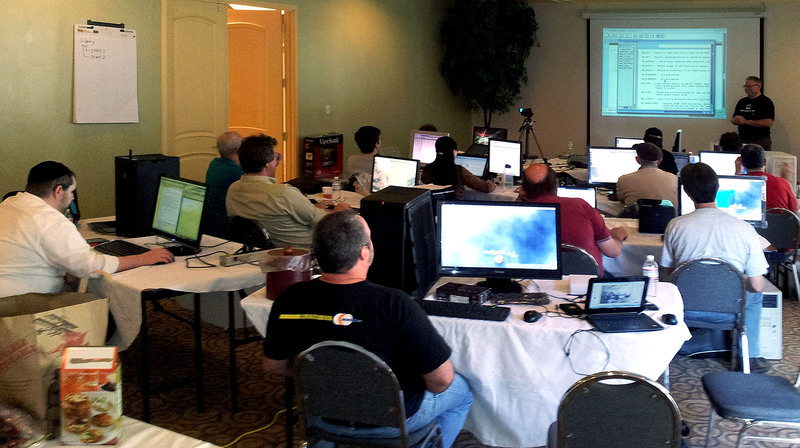 Steven Solie, AmigaOS 4 Team lead, will be holding another pre-show Programming Workshop which commences on the evening of the 16th. He will be assisted by Paul Sadlik and other AmigaOS experts and has promised prizes for the best students. 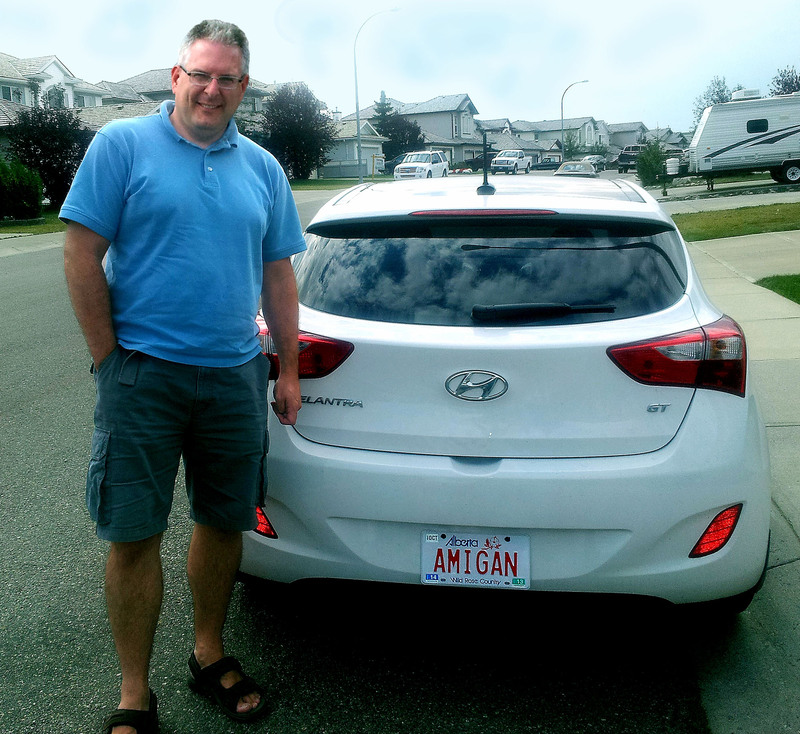 I'm writing this blog on the eve of my flight to Canada to attend AmiJAM 2013 organised by AMUC in beautiful downtown Calgary. It's many years since I was last in Calgary and, although I've made several visits to AmiWest, this will be my first trip to an Amiga show north of the border. I'm really looking forward to meeting members of the Amiga Users of Calgary and if you are in the area and want to talk Amiga, call in and say hello, but please note I may be a bit jet-lagged! 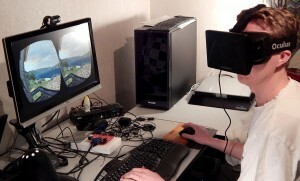 The other day I received an invitation from Amiga graphics guru, Hans de Ruiter to test out the Oculus Rift VR headset. If you are a regular reader of my blog, you may recall that I subscribed to the Oculus Rift Kickstarter project and purchased several headsets for AmigaOS 4 developers to play around with. Having not had a chance to try our one of these devices I accepted Hans' invitation and drove over to his place which is about 45 minutes away. The Oculus Rift headset is supplied with three pairs of removable lenses to switch the focal distance and possibly enable you to use the headset without glasses if you are near of long-sighted. With the correct lens pair installed it is possible you could use the headset with glasses or contact lenses. However, although I am slightly short sighted, we decided not to change his current lens configuration and calibrated the headset for my use with the pair that was already installed. 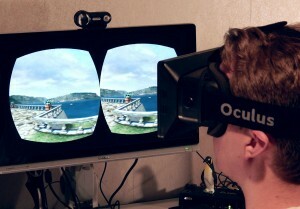 Although the Oculus Rift headset has generally had rave reviews, people have complained about the relatively low resolution of the developer kit (640×800 per eye producing 1280x800) which means you can see individual pixels very clearly, and even the black pixel edges. The LCD's response time also causes ghosting/blurring when you spin your head around quickly. As Hans said, this probably wouldn't be noticeable if you were watching a movie, but is noticeable when exploring virtual worlds or playing games. Fortunately, the consumer version should address both of these issues. However, as Hans reported, the response time to head movement is definitely good, so it does feel like you're looking around a virtual world when you rotate your head. The manufacturers recommend that, at first, you use the headset for short periods to build up your "resistance" to motion sickness. Hans admitted to me that he can now use the device for 15 minutes without feeling any nausea, so it was with some trepidation that I tested the device as I have a low tolerance to motion sickness. 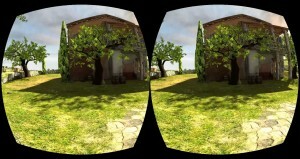 For me at least, the low resolution pixels were not a distraction as I used a combination of joystick and head movement to walk around the virtual world demo of a Villa and garden in Tuscany . 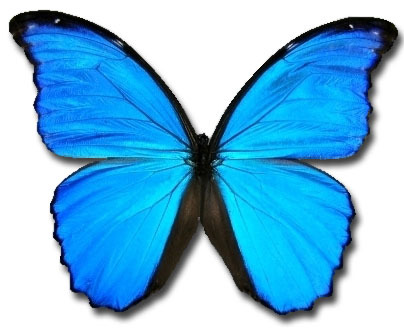 It was very impressive, complete with birds, floating blossom and blue MorphOS butterflies. You can walk up stairs, look over balconies and even down down over the edge of the cliff to the beach and shoreline far below. However, after about 10 minutes exploring the the virtual world my "virtual headache was real enough. Despite, this I was really impressed with what has been achieved so far. Will this latest attempt to bring Virtual Reality to the masses be a success? Only time will tell. Out of curiosity, Hans plugged the Oculus Rift into one of the USB ports on his AmigaONE-X1000. The USB stack reported that it was a "Tracker DK" made by "Oculus VR, Inc which as Hans said, is nothing remarkable but still reassuring nevertheless. 😉 Incidentally on the drive over to meet Hans I passed a street sign for West Chester! Now how's that for a virtual reality coincidence? I have just completed another edition of my Classic Reflections series for Amiga Future magazine. Well that's actually not true, I completed Part 1 of Whatever happened to Great Valley Products? Part 2 will have to wait until I return from Canada. Although I knew GVP as a manufacturer of quality SCSI hard disk cards and RAM boards I had not quite appreciated just how productive this company had been during the Amiga's heyday. I was approaching my usual 30K characters limit when I realised that unless I split the edition into two parts I would not be able to do justice to the contribution made by this active and dynamic company who, in 1993, was ranked at number 155 in Inc Magazines top 500 fastest growing privately held companies in the USA. Look out for Part 1 of Whatever happened to Great Valley Products? 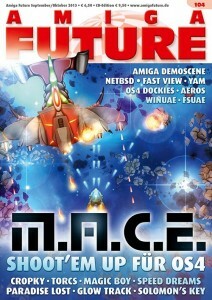 in issue 105 of Amiga Future. In the meantime pick up a copy of issue 104 and read about the new M.A.C.E. game and find out "What really happened to MacroSystem?" Following the news that Big Brother really is watching us it seems that the New Zealand government is keen to join the ranks? Despite a lot of protest and dissension from the general public, parliament has narrowly passed new legislation, by a vote of 61 to 59, that gives the GCSB, New Zealand’s version of the NSA, extra surveillance powers to assist the police, Defence Force and the Security Intelligence Service. Opponents to the new law claim that the new powers will open the door to the NSA-style monitoring of New Zealand citizens and sounds the death knell for privacy rights in New Zealand. According to a recent poll carried out by Fairfax Media-Ipsos three quarters of New Zealand’s population is “concerned by the law.” One New Zealand resident who is is perhaps more concerned that others is Megauploads founder Kim Dotcom, who is currently fighting extradition to the USA to face charges of alleged criminal copyright infringements, racketeering and money laundering related to the cyberlocker site. 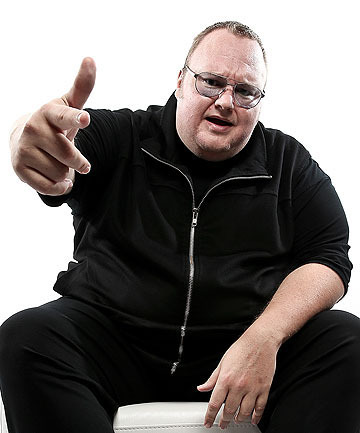 Dotcom has been a vocal critic of the new bill and tweeted his condemnation when the legislation was passed. Now there's a surprise! In the latest twist in the saga, Dotcom has stated he is considering forming a new political party which he promises would bring New Zealanders a new submarine cable, fair Internet pricing and no more data caps. ....and finally......when you know you are an Amiga geek! Keep this "birthday" party going! 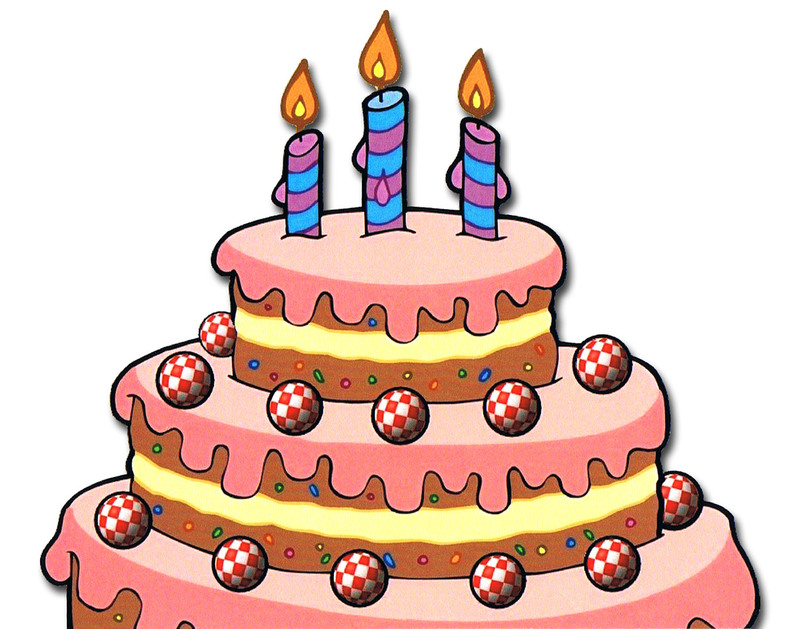 Recently I celebrated one of those "special" birthdays and received a customised card through the post from an Amiga well wisher. 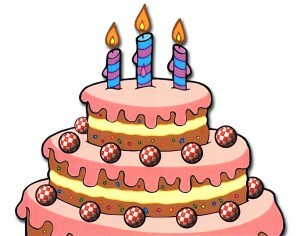 It's a good job the number of candles and "Boing Balls" did not match my actual age. Apart from being a fire hazard it would be a bit like the famous (mis) quote from one of my favourite Scifi books and films, "My God—it's full of Boing Balls!" (With apologies to Arthur C. Clarke ;-)) Geek mode off!